Please see the following links for TARA’s meeting minutes from October, November and December 2014. 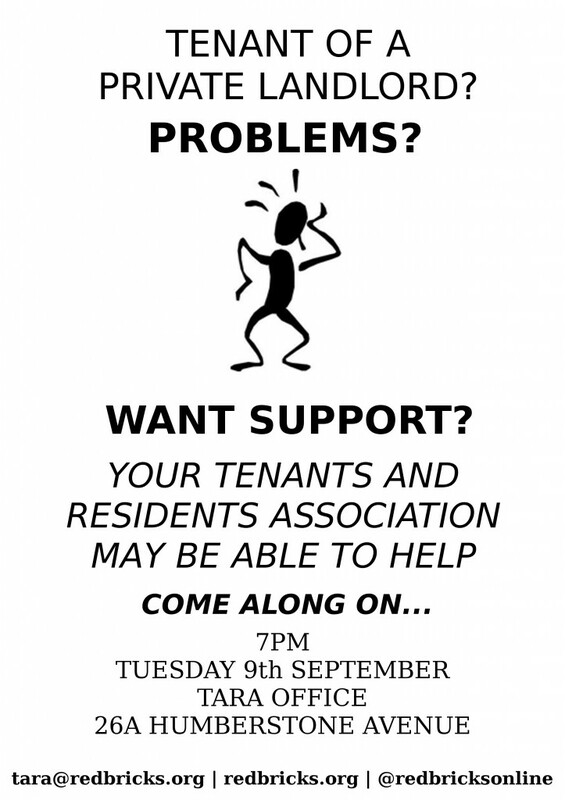 Please find TARA’s monthly meeting minutes from September at the following link. Please see the following links for TARA’s monthly meeting minutes for July and August 2014. City South Manchester have recently given the go-ahead for local artist Karl Macauley of Elegant Chainsaw Carvings to work with local residents on designing and carving artworks from tree stumps around the estate, following the recently completed tree works. Whilst we were sorry to see these mature trees come down, some of which were unfortunately diseased, we think that transforming these stumps into artworks will add a great feature to the estate. Stump 1 on Leaf St. Stumps 2 & 3, on Hulme St. at the end of Leaf St./Hunmanby Ave. 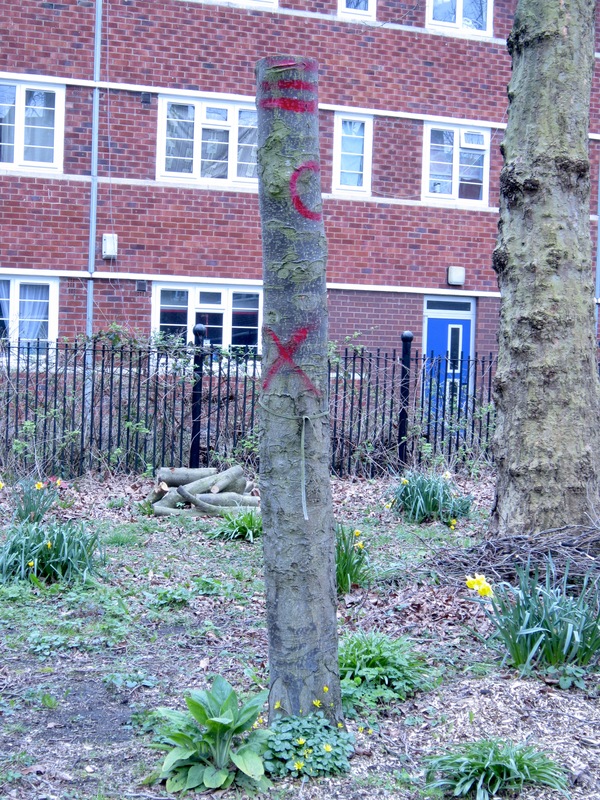 There are a total of 6 tree stumps marked for carving: 1 on Leaf Street, 2 on Hulme Street and 3 on Letsby Avenue. 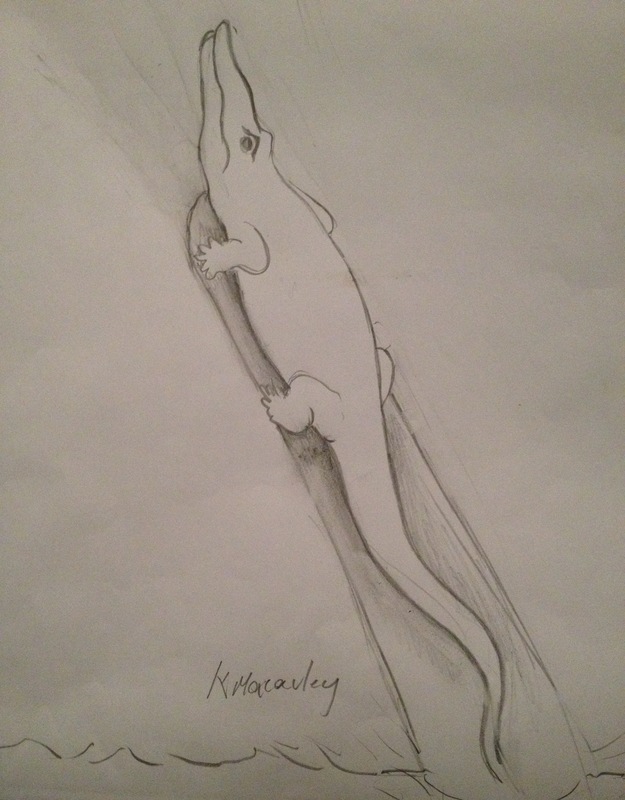 The stumps are quite narrow, which will restrict the possibilities somewhat, but Karl has sent us some initial design ideas based on what the natural forms of the stumps suggest, such the crocodile drawing below. We’re keen for residents to make design suggestions, and a number of people have already expressed the idea that they would like to see things in keeping with the local wildlife such as squirrels, frogs, birds and bats. Others would like to see foxes, owls, giant mushrooms, Easter Island heads and totem poles. 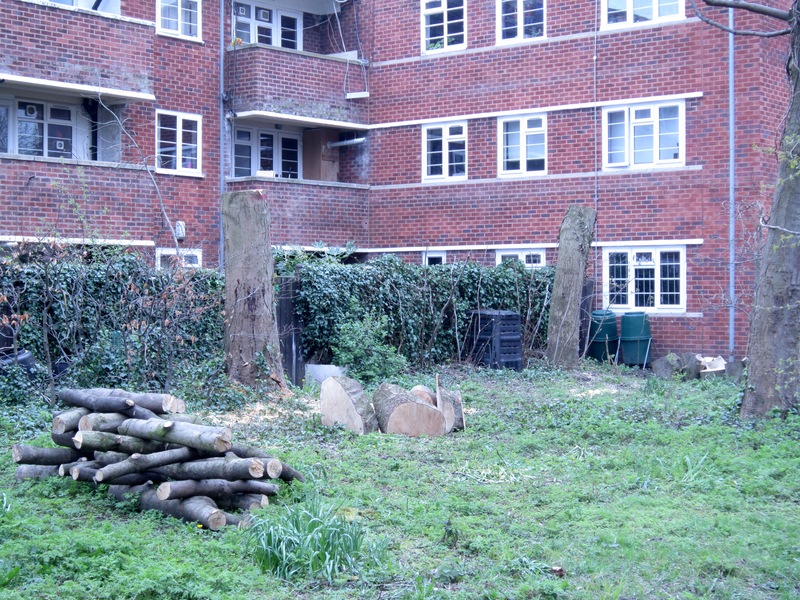 If you have any design suggestions for particular tree stumps on the estate, please get in touch directly with Karl at k.makosa@gmx.com, copying in Gemma Angel on gemmellibean@gmail.com, and tara@redbricks.org. 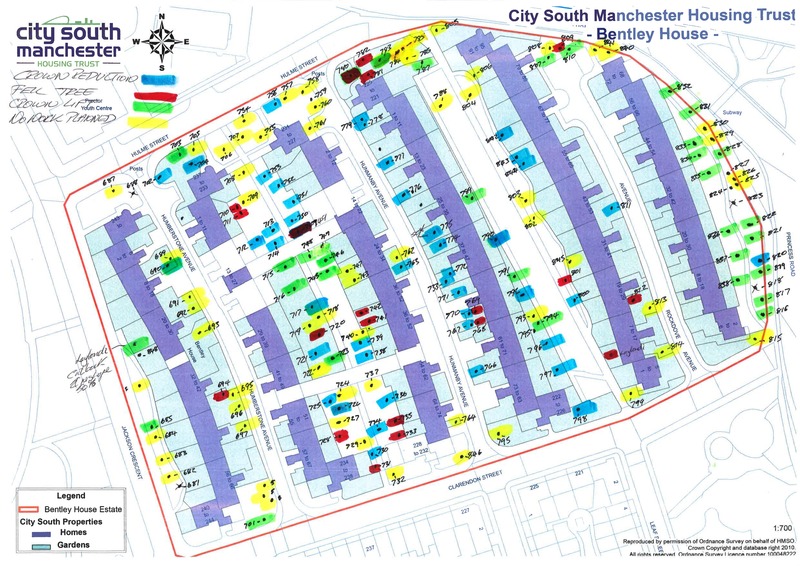 During the meeting between City South Manchester and TARA last Friday, it was agreed that representatives of TARA and any interested residents would meet with Nick Moulding, the surveyor who is now responsible for overseeing the tree works on the estate, to do a walk through of the revised plans. This took place on Wednesday this week, and was attended by a number of residents, as well as Gemma Angel on behalf of TARA. A number of discrepancies between the revised map and the list of planned works Mr. Moulding had received were identified, and an updated map has been re-issued (see below). 809 at the end of Rockdove Avenue is no longer marked for felling, and 759 at the Hulme St. end of Hunmanby Avenue will now be crowned. This map has been simplified to include only those trees with scheduled works. 710 & 711– The proposed felling of these two small Hawthorns has been contested by 5 residents in this area, forming a majority opinion at this time. These trees will therefore not now be felled. 713– Some residents suggested that this tree should be felled, as it is crowded by 712 and 714, and that this would open up the canopy further to allow in more light. This was considered preferable to felling 749. 752– CSM has made the decision to remove this Elder bush on the grounds that it is growing through the fence and causing damage to property. CSM’s decision in this case overrides previous decisions. 751– Now scheduled for crown lift and thinning rather than crown reduction, to avoid damaging an active squirrel drey in the top of the tree. 747 & 746 – Several residents immediately affected by these two trees have requested that they be felled. As these are large trees, more time will be allowed for other residents in the area to comment on this proposal before any felling goes ahead. It was noted during the walk-through that 734 has already been crowned in recent years. However, 727 has a number of long branches very close to the upper floor windows. 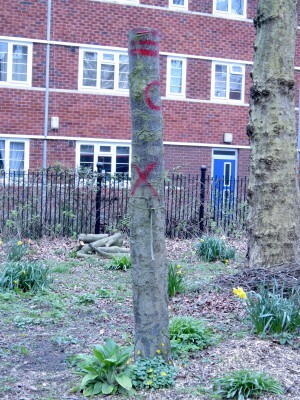 Consequently the status of these two trees has been altered. 727 will now be crowned, and 734 is now marked for no works. If any residents have further comments or questions about the tree works, please contact Gemma Angel on gemmellibean@gmail.com, copying in Nick.Moulding@citysouthmanchester.co.uk and tara@redbricks.org. Work will recommence on Monday 24th of February and will take 2-3weeks, beginning with crowning work and starting in Zone 1, at the top of Letsby Avenue. Following a meeting with TARA representatives on Friday 21st of February, CSM have agreed to a significant reduction in the number of trees to be felled, and an increase in crowning work across the estate, which is a better than expected outcome. Alan Leicester has also agreed that a long-term management plan for Redbricks green spaces needs to be put in place, working in consultation with the community. Any future plans will involve the re-planting of a variety of new trees across the estate. The remaining trees marked for felling are either diseased or deadwood (735, 780, 781 801, & 809); are considered dangerous due to their size and proximity to buildings/instability (733 & 782); or are the subject of specific requests by residents immediately affected by them (694, 710, 711). In this latter group, a number of these are in back gardens, and were not marked for any work of the original map (742, 741, 768, 769, and the Leylandii on Leaf St.). The number of trees to be felled has been reduced by a third from 30 to 20; 5 of these are new requests for trees in gardens to be removed; there are also 2 felling substitutions suggested by residents which are different from the original plans. 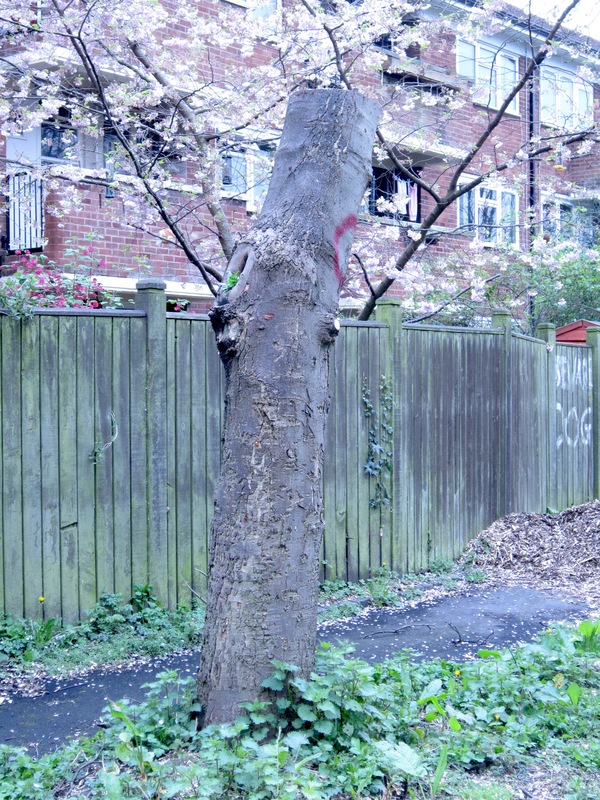 Tom Rock has promised that the 3 trees at the end of Hunmanby Ave./Hulme St. to be felled will be replaced with new trees this season. 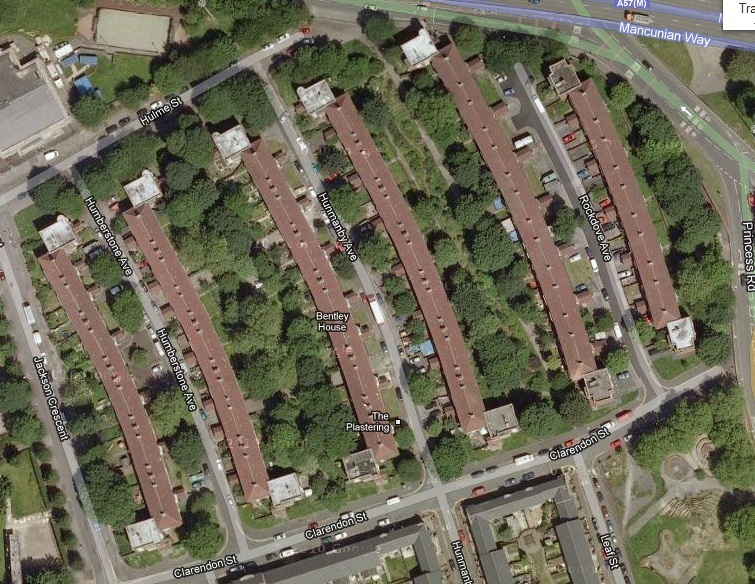 The majority of mature trees scheduled for felling, including those on Leaf street, will now be crowned instead. More crowning work will be carried out on Letsby Avenue, particularly in Zone 1, to both increase light levels and avoid the felling of healthy trees. Crowning work will resume immediately. Felling will take place later, to give people further opportunity to feedback any issues. If any residents have any more concerns regarding the felling of specific trees, please get in touch with TARA. Thanks again to all those who came out and had their say! 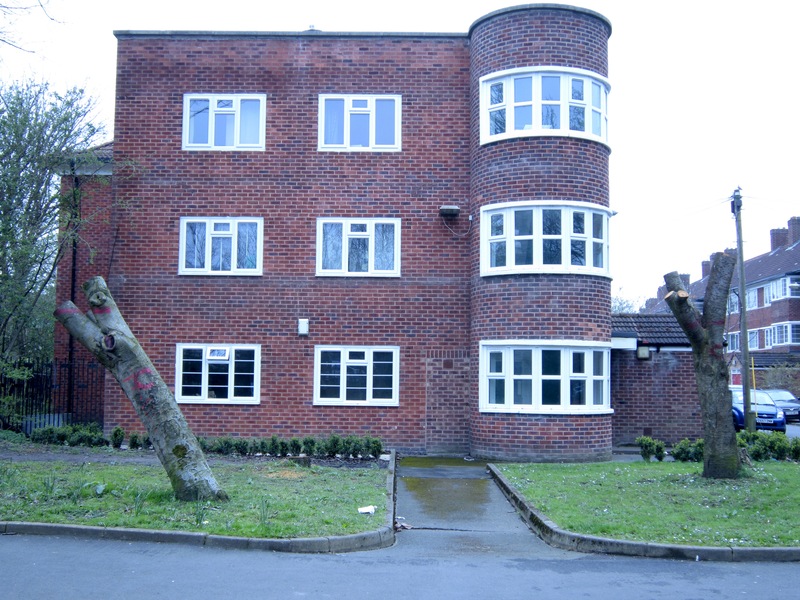 On Saturday 15th, Monday 17th and Tuesday 18th of February, three consultation sessions took place at the TARA office regarding proposed tree works on the estate. 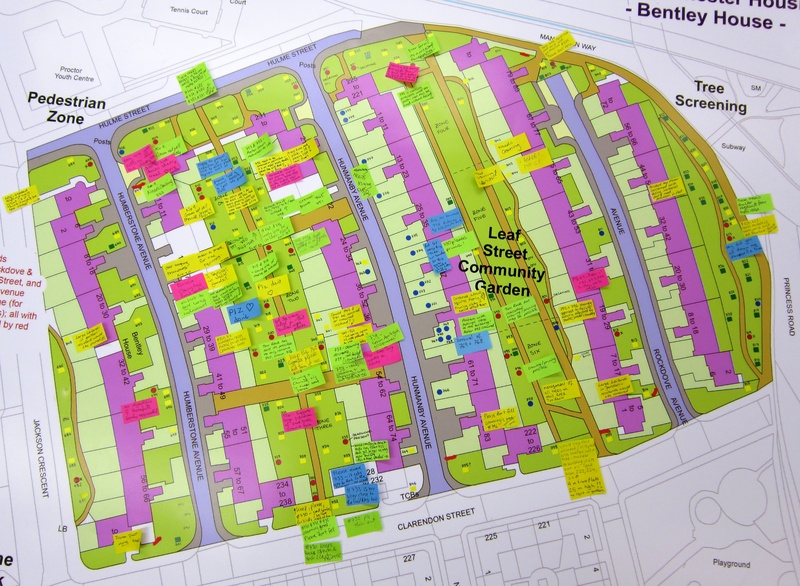 A detailed map of the plans was made available for residents to comment upon using post-it notes (see below), and organisers were on hand to take notes on residents’ views. A total of 56 people participated in the consultation, either by attending the open trees meeting at the TARA office on the 13th, one of the three consultation sessions, or by passing on their comments via e-mail or phone. We are very pleased with the turnout to what was necessarily a very adhoc and last-minute exercise. We sincerely hope that the short-notice nature of recent discussions can be avoided in future, and that City South will engage in meaningful and inclusive consultation with residents about maintenance of green spaces on the estate. All the feedback from the consultation has now been collated into one document, which can be viewed or downloaded here: Redbricks Tree Works Consultation 2014 This document has also been forwarded to City South, and we await their response. Thanks to all those tenants and residents who have contributed to the community consultation over the past five days! A meeting is scheduled between TARA and CSM tomorrow morning, after which feedback from CSM on the consultation report will be publicized. 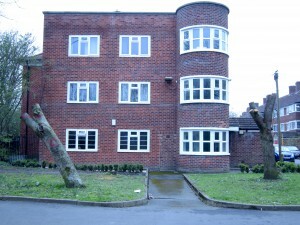 Tree Works on the Estate: Come and View the Plans! TARA has recently responded to residents’ requests for more consultation on tree works scheduled to take place over the next two weeks, especially regarding the proposed felling of 30 trees across the Bentley estate. Work has already been carried out on the Princess Parkway facing side of Rockdove Avenue (evens), and along Jackson Crescent, effecting residents on the evens side of Humberstone Avenue. TARA is not opposed to tree maintenance works, but is concerned that City South have not engaged residents in a consultation process on this issue. Following meetings between concerned residents, TARA and City South staff this week, City South agreed to give us copies of the plans, and put a temporary hold on any more felling work until we’ve had a chance to share the plans with residents and get some feedback. 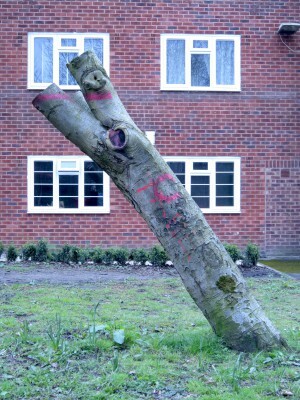 Are you concerned about the removal of particular trees that will affect you? 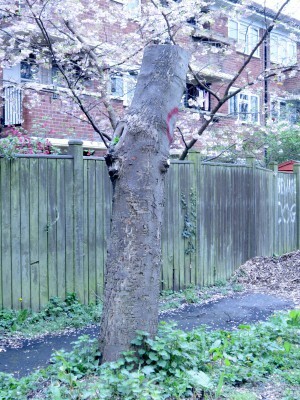 Are there trees near you that you would like to see pruned/removed? Is the right work being carried out on the right trees, in your opinion? Do you have any other comments on the plans? 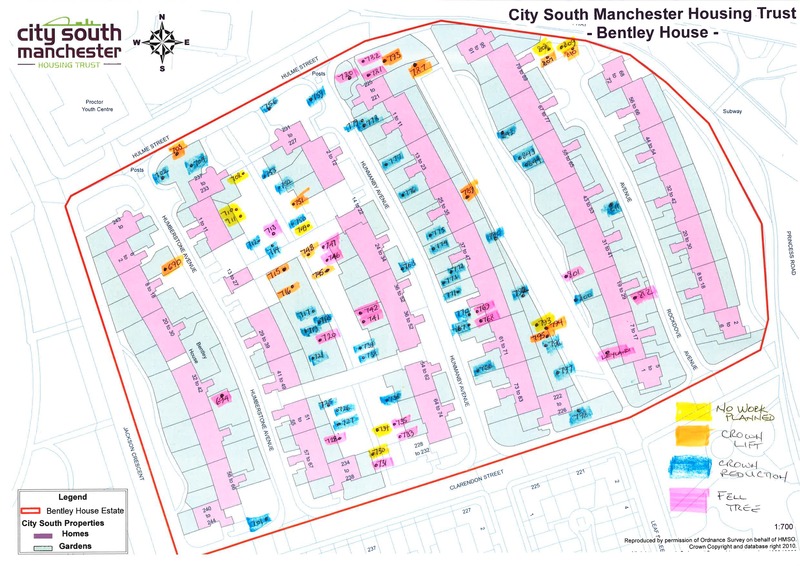 We hope to feedback residents’ views to City South at the end of next week, and come to some consensus on the works that is both productive and positive for as many residents as possible. Everyone is welcome, so please come along to one of the sessions above and express your views! A larger, more user-friendly version of this map is available to view in the TARA office.